Hey everyone, it’s your friendly neighborhood BAA Treasurer! There were no rolls this weekend, so instead of your standard rolls report, we here at BAA HQ decided to give you a financial report! We’re often asked a few questions related to finances, such as “where do my donations go?” and “how much money does the BAA have?” So this year, we’ve decided to increase the BAA’s transparency and open the books! You may have noticed, for the last couple of years, that the Buggy Alumni Association logo has been strewn about the course, as well as on cmuTV during coverage of Raceday. While this may seem like a perfect synergistic opportunity to promote the BAA (and it is! ), for the last 2 years the BAA has actually be an official sponsor of Raceday. One of our founding missions is to support the undergraduate buggy community, and we have been fortunate enough, thanks to the generous donations of our members, to be able to pick up the slack when other sponsorships have fallen through. 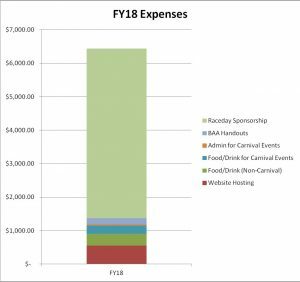 This sponsorship costs approximately $5,000 (due to some bookkeeping matters, it was slightly larger in FY18), and this was, by far, our largest single expense in FY18. We do also have some other Raceday-related expenses that aren’tdirect sponsorship. The website itself costs money, so some of our donations go to support our online presence. We hand out various items at Raceday, such as the ever-popular Raceday Guides, which requires us to pay for the printing in the necessary quantities. We also host multiple events during Carnival (the Finals Auction, the panel during the Buggy Showcase), for which we provide catering, as well as any non-food/drink costs associated with the event. Then there are the non-Raceday costs. There are several programs throughout the year involving buggy (events such as Tom Wood’s History of Buggy presentation), which we help support. We also provide food during certain morning rolls, such as on Parent’s Weekend and during Homecoming. In some years (though not FY18), we also have some one-off costs related to specific BAA projects, such as the new timing systems in use during Raceday 2017, or the lego buggy sets for the Kidzone that you see during Carnival. We are always happy to support alumni projects that benefit the buggy community as a whole, and it’s exciting when something new hits our radar. In fact, we may have some ideas for the upcoming year. So how much did we bring in? Our two main sources of income are membership donations and our lead truck auction. Although we require a $10 donation in order to be an official BAA member (which entitles you to great perks such as the Raceday Preview and the Raceday Recap), we welcome donations of all shapes and sizes. Luckily for us, we have some very generous alumni that donate more than $10. Unfortunately, our membership was down this year – we only had 82 official members in FY18, which is our lowest total in a number of years. Those 82 members donated a total of $3,339.94 in FY18. The Lead Truck Auction has been our only real fundraiser for the last few years. And while it does well to bring in some money for us, as the “novelty” of the lead truck has worn off, the amount that we raise from the auction has decreased. The first year of the lead truck auction brought in roughly $2,000. But in recent years, we have failed to achieve our $1,000 goal; this year we brought in $783. 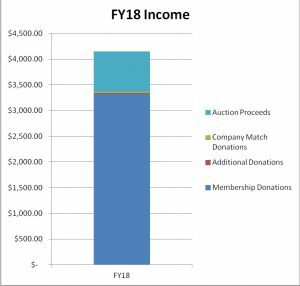 We also occasionally receive company matching donations (certain companies match an individual’s donation to a non-profit organization), though we did not receive any in FY18. You’ll notice from this comparison of income and expenses that, well, we spent far more than we brought in this year. The Raceday sponsorship alone was more than we brought in during FY18. And the results were similar in prior sponsorship years. Thanks to our generous donors in the past, we had a bit of a nest egg built up and were able to support these extra expenses. But at the current rate, we may only be able to do that for one or two more years. And that’s assuming that all our other expenses are kept to a minimum, which may mean fewer alumni projects supported. This isn’t meant to be a “ALL HOPE IS LOST!”, “THE SKY IS FALLING” type of post that scares you into donating. We’re in decent financial shape for now, and we here at BAA HQ are working to put us on more solid financial footing going forward. No one is obligated to donate, and we welcome all visitors and fans of Buggy, regardless of whether you are a BAA member. But if you do want to help support the BAA and the buggy community at large, what can you do? Well, there are a few options. The easiest way is to become a member of the BAA! If you liked buggy back when you were at CMU, or you find yourself on the BAA website an unusually large number of times during the course of the year, JOIN US BY DONATING HERE! It only costs a tax-deductible $10, and in addition to helping support the BAA, it also gives you access to our Raceday Preview, Raceday Recap, and any BAA-only events that we throw! It’s the easiest way to help support the Buggy community. Plus, it makes you a Loyal Scot for the year, and CMU offers perks to Loyal Scots. Of course you don’t need to be affiliated with buggy, or even CMU, to donate – We accept everyone! So if you are one of those people that has photos of Buggy at your desk, constantly talks to people at work about your races that time your team was “good” back in 2009, and convinces them to watch Raceday live even though you’re now an alum, see if they would have any interest in donating! It’s still a tax-deductible donation for them, even if they have no connection to the sport. The last thing is to see if your employer offers a matching donation. This costs you nothing other than what you were already donating, but gives the BAA some extra funds. CMU’s donation page even has a helpful search function to see if your company matches donations to CMU. We’re planning for this type of financial report to be presented on an annual basis going forward, so that all BAA members can hold the board accountable for what we do to support the buggy community. So if there’s any other information that you are curious about, or think would be useful, let us know, and if we can provide it, we will! We here at BAA HQ are looking forward to the 99th Raceday this April, and with some fun things planned for this year, we hope you’re excited as well. See you at the course!